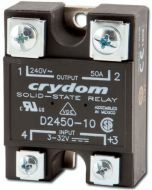 Solid State Relays (SSR) are the heart of many modern dimmers. These SSR units switch on and off many times per second to "dim" the connected load. Not to be confused with Pulse Width Modulation (PWM) Sine Wave Dimming, or Silicon Controlled Rectifiers (SCR). We recommend double checking the part number on your existing unit before ordering. 1.42" x 1.8" x 2.3"